for brunch, i made an onion with a little bit of omelette. i had half an old onion that had some fuzz on it (must've been in my fridge for weeks). i sliced off the moldy end and chopped up the rest of the onion, while i had two eggs (with some milk) cooking over the stove. once again i had a hard time flipping my omelette, so i just dumped the rest of the ingredients into the pan (onions, scallions, ham) and folded the omelette in half. the resulting creation, served with a cup of mango juice, left a burning feeling in the pit of my stomach because of all that raw onion. around noontime eliza came over, we were going to go bulbs shopping. we had the customary "what have you changed in your house since my last visit?" tour (armchairs! bathroom medicine cabinet! potted plant! tree stump! ), eliza making particular note of my lists of things to buy posted on the fridge. we also compared some cooking notes when i explained to her my onion omelette mishap, she recommended that i sauté my onions next time. we then sat for a few minutes, briefly catching up. she told me that she recently started a weblog of her own, and spent a late night yesterday fueling her new addiction, which explained why she was tired. we then went to the mahoney's in winchester. there was a free green mountain coffee dispensing machine, and the both of took turns getting a cup, working the high tech automated coffee maker after one of the worker's there showed us how to do it. mahoney's was all about the christmas holiday, large green houses after green houses of poinsettas (in various shades of red and white) and wreath decorations, while outside christmas trees of all sizes were being sold. we wandered around, sniffing the flowers, reading the indentification labels, checking the prices. we saw the birdcage filled with color canaries, finches, and quails. i scoffed at the venus flytrap jars, thinking back on how hard it was to keep one this past summer. 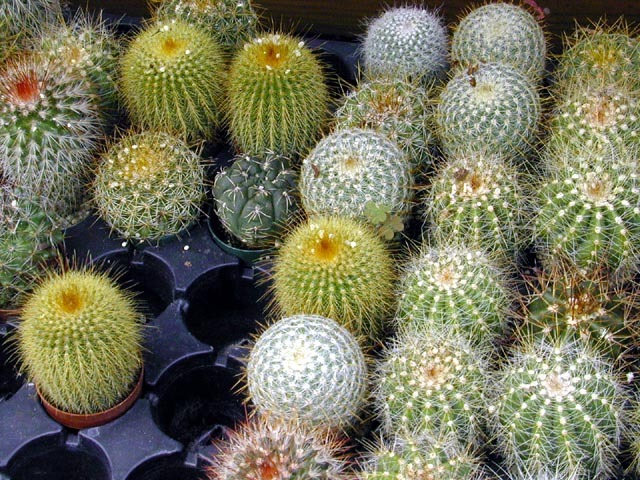 i pricked my fingers on some miniature cactuses that i thought looked like candy bon bons. eliza bought a tropical air plant (Tillandsia), plus bagful of bulbs, including amaryllises and paper whites (narcissus). as for me, i bought a ceramic wormie, that indicates when a potted plant needs watering or not. i also bought a bottle of schultz plant food. after eliza dropped me off, i tried out the wormie in my potted jasmine plant sitting in the kitchen. it didn't really do anything at first, until i watered the plant, and then the ceramic wormie soon wicked up the water like a sponge. it's kind of gimmicky, the best indicator is still sticking a dry finger into the soil to test for moisture, but you know, something for the kids. i also fed my sequoia plants some of that 10-15-10 liquid plant food mixed with some water. out in the backyard, still no indication that any birds have visited my feeder. i think i had it too out in the open, and only the bravest birds (such as chickadees) would venture to investigate it, and even then they're only on the feeder for a second or two, grabbing a seed, before flying off. at least with my three tube feeder it had perches for the birds to land on and eat. the globe is more of the fast food take out of feeders. later in the evening my father came over with a distant relative of ours visiting from sacramento, da bo (not his name, but his chinese familial designation), the son of my grandmother's sister. when my father was a child in taipei, da bo lived with my grandparents and him. he was telling us stories about my grandmother when she was a young woman in wartime china. da bo just recently went back to his hometown in shenyang, china, after 54 years. he said he didn't recognize anything, but for $1000 renminbi (about US$120), he could buy the house were he was born. i know nothing about my distant relatives. sometimes i'm curious, but i am so far removed from my original culture, my ancestral roots, that it's not something i dwell on. i think this is the archetypal american experience though, a nation of immigrants. after dinner (meat buns), i made a smoothie, and then went about making a flan. i melted a half cup of sugar to make the caramel topping, then heated two cups of milk with the flan mixture. little did i realize, once the flan mix came to a boil, it quickly overflowed the pot. i moved it to an empty spot, but not before spilling a third of the fan all over the stovetop and singeing the hairs on the back of my hand from the still-on stove.